Town Planning in Hong Kong aims to promote the health, safety, convenience and general welfare of the community through the process of guiding and controlling the development and use of land, and to bring about a better organized, efficient and desirable place to live and work. The Town Planning Board (the Board) is a statutory body established under section 2 of the Town Planning Ordinance (the Ordinance) with a view to promoting the health, safety, convenience and general welfare of the community through the systematic preparation of plans for the layout of such areas of Hong Kong as the Chief Executive may direct, as well as the types of buildings suitable for erection therein. Under the Town Planning (Amendment) (No.2) Ordinance which came into operation in November 1991, the Town Planning Appeal Board has also been set up to hear all the appeals against the Board's decisions to reject the planning applications upon review. For the better discharge of the Board's functions, two Planning Committees, namely, the Metro Planning Committee and the Rural and New Town Planning Committee were set up to facilitate the preparation of statutory plans and consideration of planning applications. Moreover, the Board is empowered to appoint committees, namely the Representation Hearing Committee, from among its Members to hear representations. The Board is a statutory body established under section 2 of the Town Planning Ordinance (the Ordinance), Cap. 131 of the Laws of Hong Kong. The Board's main functions are laid down in section 3 of the Ordinance, i.e. to promote the health, safety, convenience and general welfare of the community through the systematic preparation of plans (that is, Outline Zoning Plans (OZPs) and Development Permission Area (DPA) Plans) for the layout of such areas of Hong Kong as the Chief Executive may direct, as well as the types of buildings suitable for erection therein. The Board considers representations to these plans, comments on representations and further representations under sections 6 and 6A to 6H of the Ordinance; and submits draft plans together with any representations, comments on representations, further representations and any amendments made to meet the representations/further representations to the Chief Executive in Council under section 8 of the Ordinance for a final decision. It also considers applications under sections 12A, 16 and 16A, and conducts reviews of its decisions on sections 16 and 16A applications under section 17 of the Ordinance. In addition, under section 25 of the Urban Renewal Authority (URA) Ordinance, Cap. 563 of the Laws of Hong Kong, the URA may submit any plan prepared under subsection (3)(a) of the URA Ordinance to the Board for consideration. Upon the submission of a plan so prepared by the URA, the Board may (a) deem the plan as being suitable for publication; (b) deem the plan as being suitable for publication subject to such amendments as the Board shall specify; or (c) refuse to deem the plan as being suitable for publication. A plan which the Board deems suitable for publication under subsection (6) (a) or (c) of the URA Ordinance shall be deemed to be a draft plan prepared by the Board for the purposes of the Ordinance and the provisions of the Ordinance shall apply accordingly. The Board consists of the Chairman [currently the Permanent Secretary for Development (Planning and Lands)], the Vice-chairman, five other official Members [currently the Director of Planning, the Deputy Secretary for Transport and Housing (Transport)1, the Director of Home Affairs, the Director of Environmental Protection and the Director of Lands, or their alternates] and 29 non-official Members. The Deputy Director of Planning/District was appointed as the Secretary to the Board. The Board meets regularly to discharge its functions, normally on alternate Fridays of each month. 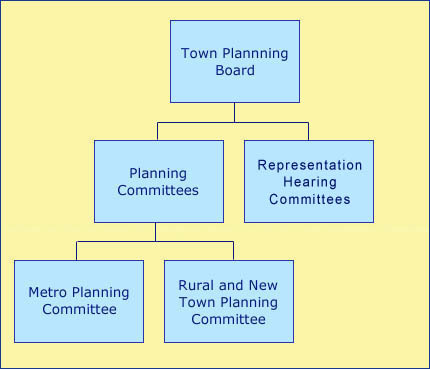 With the enactment of the Town Planning (Amendment) Ordinance 1991 which extended statutory planning to the non-urban areas and the general increase in the workload of the Board, two Planning Committees were set up, namely the Metro Planning Committee (MPC) and the Rural and New Town Planning Committee (RNTPC). The geographical jurisdiction of the MPC and RNTPC. Each Committee comprises the Chairperson (currently the Director of Planning), the Vice-chairman (a non-official Member), four other official Members (currently the Deputy Secretary for Transport and Housing (Transport)1, the Director of Home Affairs, the Director of Environmental Protection, and the Director of Lands, or their alternates) and 13 (MPC) / 13 (RNTPC) other non-official Members. The Deputy Director of Planning/District was appointed as Secretary to the two Committees. All Members of the Committees are appointed by the Chief Executive from the Members of the Board in accordance with section 2(3) of the Ordinance. Membership of MPC and RNTPC. Systematic preparation of new draft Outline Zoning Plans and draft Development Permission Area Plans under section 3 and section 4(1) of the Ordinance. Consideration and approval of Master Layout Plans and subsequent amendments in Comprehensive Development Areas under section 4A of the Ordinance. Exhibition of new draft plans pursuant to section 5 of the Ordinance. Making and exhibition of amendments to draft plans under sections 7(1)-(3) of the Ordinance. Submission of draft plans to the Chief Executive in Council under section 8 of the Ordinance for approval. Pursuant to sections 12(1)(b)(ii) and 12(3) of the Ordinance, making and exhibition of amendments to plans referred back by the Chief Executive in Council under section 12(1)(b). Consideration of applications for amendment of plan, planning permission and amendment to permission under sections 12A, 16 and 16A of the Ordinance respectively. Designation of Development Permission Areas under section 20(1) of the Ordinance. The two Committees meet regularly to discharge their functions, usually on the other Fridays of each month when there is no meeting of the Board. The Board is required to complete consideration of representations/further representations and submission of draft plans to the Chief Executive in Council within a statutory time limit of nine months. There is a provision to extend the time limit to a maximum additional period of six months by the Chief Executive. In order to expedite the representation consideration process, the Board is empowered to appoint committees from amongst its Members to hear representations/comments on representations/further representations. The Representation Hearing Committee (RHC) is appointed on a plan by plan basis. The Board will decide whether a RHC should be appointed to hear the representations. For representations which are of significant territorial interests or would attract wide public interests, the Board may decide to conduct the hearing itself. Membership of RHCs is normally appointed by roster. However, Members with expert knowledge relevant to the representation cases may also be appointed. Each RHC consists of a Chairperson (currently the Director of Planning), a Deputy Chairperson (a non-official Member), two official Members and five non-official Members.